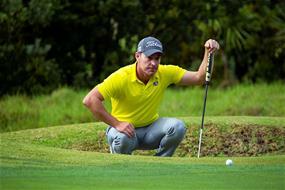 Two-time defending champion Gareth Paddison has got his title defence off to a great start at the 10th Autex Muriwai Open with an opening round of six-under 66 on the Jennian Homes Charles Tour. It’s clear he has a love-affair with the Muriwai Beach Links as he searches for a famous three-peat this week and now has a one-shot lead over 2015 champion Dan Pearce and amateur Kerry Mountcastle. The weather gods were also on his side with the morning field having a large advantage as conditions got fiercely difficult later in the day, but no one can argue with Paddison’s back nine of five-under in his last seven holes. “It was a fantastic day and walking off the course with a birdie to finish was nice as well, so couldn’t be much happier to start with and to come home with five birdies was great and a little unexpected,” said the experienced Paddison. Pearce continued his recent form from the Akarana Open but it was Mountcastle’s afternoon round of five-under that really impressed during the toughest part of the day with wind and rain thrashing in from the west. He may have proven that being a Wellingtonian does help with the New Zealand representative not making a single bogey, a rare feat on the beach today. The chasing pack is an exciting one with local Mark Hutson shooting four-under par alongside Lachie McDonald and Dongwoo Kang who continues to impress, on the back of a tied second finish at the Akarana Open. They are followed by Sam Yoshifuji and the country’s number one amateur Daniel Hillier a further shot back. Although he will be slightly disappointed with his day, Akarana Open champion Josh Geary is still within striking distance with an opening round of one-under par. His double-bogey on 10 was a small set back but after making nine birdies in the pro-am yesterday there is still plenty of time for the European Tour player. 2016 New Zealand Open champion came out of the gates hot with a birdie, eagle start before having to settle for a round of even-par and remain in the hunt.